The eight employees of a company are G, H, I, J, K,M, N, and O. In each of the years 2001 through 2008, exactly one of the employees joined the company. H joined the company before N.
K joined the company before J.
N and J joined the company before G.
N joined the company before O.
J joined the company before M.
G joined the company before I.
H joined the company in 2001. H joined the company in 2003. G joined the company in 2004. M joined the company in 2004. O joined the company in 2004. If J joined the company in 2002, which one of the following CANNOT be true? M joined the company in 2003. H joined the company in 2004. N joined the company in 2004. Of the following, which one is the latest year in which J could have joined the company? If O joined the company in 2005 and M joined it in 2007, one can determine the years in which exactly how many of the other employees joined the company? Assume that O joined the company before M. Of the following, which one is the earliest year in which M could have joined it? A good way to start is to locate a employee or employees who might come at the top of the sketch; that is, anyone who doesn’t seem to have joined the company after other employees. If we scan the rules, we see that H in Rule 1 and K in Rule 2 both fit that description. Let’s therefore start by putting an “H” and a “K” at the top of the sketch. H joined before N. From the H at the top of the sketch, add a line down to an N.
K joined the company before J. Next to the H at the top of the sketch, we already have a K. From that K draw a line down to a J.
N and J both joined the company before G. There’s already an N and a J in the sketch, so draw lines down from each of them to a G.
gives more information about N. N joined the company before O. From the N in the sketch, draw another line down to an O.
Here’s more information about J. J joined the company before M. From the J in the sketch, draw another line down to an M.
G joined the company before I. From the G in the sketch, draw a line down to an I. The first thing to do is check and make sure that all of the entities are included in the master sketch. If one isn’t, that’s a “floater” that can be plugged in anywhere. Fortunately, all of the entities are included in the sketch, so we can depend solely on our master sketch to answer every question we’ll face. Before moving on, take a moment and review the sketch. Some things should be obvious. For instance, K joined the company before G, I joined the company after N, etc. Also take note of the possibilities regarding the specific years; what entities could have joined the company in 2001? What entities could have joined in 08? H and K are the only entities that aren’t below an entity, so either H or K must have joined in 01. I, O, and M are the only employees with no entities below them, so they’re the only ones who could have joined in 08. While these aren’t earth-shattering deductions, it’s a good idea to take a moment and review what the completed sketch can tell you. This sets up the set’s parameters in your mind. It’s also wise to take a moment and recognize what the sketch can’t tell us. Be careful not to assume any relationship between employees that aren’t connected by lines. For example, I, in our sketch, is slightly lower than M and O. But we can’t assume that M and O joined the company before I. We don’t know that. Be very careful when dealing with the two “arms” of the sketch. The “K—J—M” arm is not connected to the “H—N—O” arm. Therefore, we can’t deduce any relationship between the two. M, for instance, is quite low on the sketch, but since it’s not connected to the “H—N—O” arm, M could have joined the company even before H. Likewise, O could have joined before K.
In a “free-floating” sequence set like this (when all the entities are in the master sketch), just check each choice against the sketch, using it to figure out the choice that is impossible. (A) H (or K) could have joined the company in 01. Answer choice (A) can be true and isn’t the answer. (B) If K joined in 01 and J in 02, then H could have joined in 03. (B) can be true and isn’t the answer. (C) Four entities, H, K, J, and N are all above G in the sketch, so at least four employees joined the company before G. The earliest that G could have joined the company is 05. Answer choice (C) can’t be true and is the answer. Quickly, here is why choice (D) and choice (E) can be true. (D) M could have joined the company anytime from 03 (K and J joined earlier) to 08. (E) O could have joined the company anytime from 03 (H and N joined earlier) to 08. Again, we can solely depend on the sketch. If J joined in 02, exactly one employee joined earlier (the one that joined in 01). Look at the sketch, K must have joined the company earlier than J, so K joined in 01. That’s all we know for sure. Either H or M could have joined in 03, either H or M or N could have joined in 04, and so on. Check each choice look for the one that can’t be true. 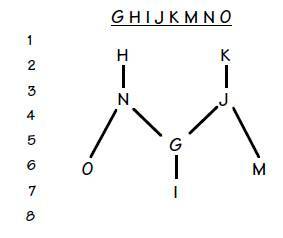 (A) and (B) Either H or M could have joined in 03 after K (01) and J (02). (C) Could H have joined in 04? 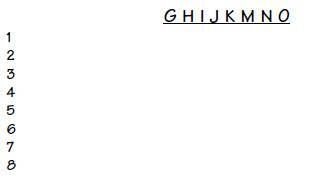 Sure, here is the ordering: K, J, M, H, N, G, I, O. (D) Could N have joined in 04? Sure, here is the ordering: K, J, H, N, M, G, I, O. (E) K joined in 01 and J joined in 02. At least H and N joined before O, so the earliest O could have joined is in 05. (E) can’t be true and is the answer. We’re asked for the latest year that J could have joined the company. There are two ways to go about this: We can put as many employees as possible before J, or we can see which employees MUST be after J. Since the latter deals with what is DEFINITELY true while the former deals with what is POSSIBLE only, the latter is most likely going to be simpler and, more importantly, quicker. Look at the sketch, only G, I, and M are definitely placed below J. Therefore if G, I, and M joined the company in 06, 07, and 08, the latest that J could have joined the company is 05, choice (D). From the master sketch, we’re able to deduce that either I, M, or O must have joined the company last, in 08. This question stem assigns O to 05 and M to 07. Therefore, I must have joined the company in 08. Now check the master sketch. H and N joined before O in the 01-04 slots. K and J joined before M and also before G. Since H and N must occupy two of the four 01-04 slots, K and J will take the other two slots which leaves G (which must go AFTER K and J) to take the remaining 06 slot. G and I are the only other entities whose slots can be determined, choice (B). Here we’re to assume that O joined the company before M, and we’re looking for the earliest that M could have joined. Since H and N joined the company before O, all three of these must have joined the company before M. K and J joined the company before M (as always), so that makes a total of five employees that must have joined the company before M. These five will at least take up the 01-05 slots, so the earliest that M could have joined the company is 06, choice (D).